Back on March 18, 2016, ran an article, “10 People (You Do not Know) Behind the Characters,” and today we take a look at 5 more characters and the persons or critters behind the character. As always, feel free to illuminate us with more information about the character or person behind the character, or to nominate those characters you think should be on such a list. Question for Students (and others): What famous character do you believe has the most surprising person behind him/her? 1. Lassie, television and movie star (dog). You may be surprised to find out that the dog that played “Lassie” in the movies was played by a male dog! Although the character was a “girl” dog, the actor canines were all males. The character, Lassie, was the creation of author Eric Knight who introduced Lassie to the world in a short story. Her breed is Rough Collie. Oddly enough, another literary character named Lassie, also a Collie, was written into existence in 1859, in a short story by Elizabeth Gaskell titled “The Half Brothers.” From 1943 to 1951, the movie studio MGM produced 6 films starring Lassie, actually a male Collie named Pal. The descendants of Pal were the stars of the television series, Lassie, that ran from 1954 to 1973. The Lassie franchise has spawned all sorts of toys and other items, animated shows, radio shows, comic books and the like. 2. Captain Kangaroo, children’s television host. Captain Kangaroo (Bob Keeshan), left, with Nipsey Russell, 1976. Uploaded by We hope at en.wikipedia. The host of the popular kids’ television show that shared the title as the name of his character (Captain Kangaroo) was Robert James Keeshan, born in 1927 in New York. Other than becoming an iconic television legend that appeared on the small screen from 1955 to 1984, Keeshan is also somewhat infamous for an urban legend that has it that actor and real life tough guy Lee Marvin while appearing as a guest on the Tonight Show with Johnny Carson named Keeshan as the bravest man Marvin had ever served with, specifically concerning Keeshan’s supposed heroics at the Battle of Iwo Jima. Sorry to burst your bubble if you have heard and believed this urban myth, but Marvin did not take part in the Battle of Iwo Jima, although he really was a rough and tumble combat Marine from World War II. Marvin was recuperating from wounds received at the Battle of Saipan during the Iwo Jima campaign. While Keeshan did serve in the US Military during World War II, he enlisted too late to see any overseas action. Keeshan attended Fordham University and Hillsdale College prior to embarking on his television career and was married with 3 children of his own. By the way, Captain Kangaroo’s TV sidekick, Mr. Green Jeans, was played by Hugh “Lumpy” Brannum, a proud alumnus of the University of Redlands. Keeshan was apparently a well liked and good guy, winner of numerous awards and recognized for his citizenship. 3. Mr. Magoo, wealthy cartoon vision impaired old man. Mr. Magoo and McBarker from What’s New, Mr. Magoo? The short, opinionated and hopelessly confused little old man suffering from extreme myopia (nearsightedness) made his cartoon debut in 1949, a UPA production. By 1959, UPA had shut down, but not Mr. Magoo! He reappeared as a television cartoon character (The Famous Adventures of Mr. Magoo), still voiced by Jim Backus, the actor that played Thurston Howell III on Gilligan’s Island (1964-1967, and then some made for television films 1978-1981) . Casting Backus as the voice of Quincy Magoo was a stroke of genius, the perfect voice for a befuddled old man making wrong assumptions about nearly everything. Of course, in more recent years the character has taken heat for portraying the vision impaired in a comical and unflattering way, political correctness assailing cartoons! If poking fun at a handicap was not bad enough, Magoo had a houseboy named Charlie (pronounced “Cholly” in a mocking Asian accent) that was a stereotype of a buck toothed Asian. The Backus voiced cartoons continued from 1960 through the 1980’s, until the Cleveland, Ohio born James Gilmore Backus (1913) died in 1989 at the age of 76. Mr. Magoo also appeared in specials with the character playing Ebeneezer Scrooge in Mister Magoo’s Christmas Carol animated adaptation in 1962, a classic cartoon that for this author is the best of all the adaptations of that particular Dickens story. 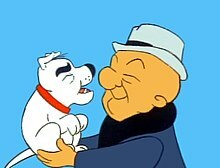 Other notable literary characters played by Mr. Magoo/Jim Backus include Merlin the Magician, Friar Tuck, and Puck, all in features as an auxiliary character. A starring role for Magoo/Backus came in 1970 with Uncle Sam Magoo, a television special with Magoo as Uncle Sam. In 1997 a live action motion picture was made with Leslie Nielsen starring as Magoo in the film, Mr. Magoo, though the film did not do particularly well, especially with all the criticism from the vision impaired crowd. (This author wears glasses and is hard of hearing, too.) The background story on Mr. Magoo identifies him as a 1928 alumnus of Rutgers University, apparently to give him some culture, and his trademark line, “Oh Magoo, you’ve done it again!” is familiar to a couple generations of kids growing up watching him on television. Kung-Fu Magoo made a direct to DVD appearance in 2011, long after Jim Backus was gone. Speaking of Backus, he also starred in a television show of his own in 1960 and 1961, running 39 episodes of The Jim Backus Show. Backus grew up at least moderately well to do and went to Shaw High School in East Cleveland, Ohio. 4. Marlboro Man, cigarette smokin’ cowboy in television and print ads. A Marlboro Man on a tobacco advertisement (Warsaw, 2000). Original uploader was Cezary p at pl.wikipedia. Kodak cameras were an American iconic brand that brought good quality photography to the masses at economical prices, but in fact, Kodak is a made up name and the guy that invented the products and founded the company was George Eastman, born in Waterville, New York in 1854. He founded Eastman Kodak Co. in 1888, their main product being photographic film on a roll instead of on plates, an inspiration from moving pictures. Kodak became synonymous with amateur photography and the company flourished, bring us millions and millions of “Kodak moments.” Alas, with the advent of digital photography Kodak tried to compete but floundered, going bankrupt in 2011 and fighting for survival since. 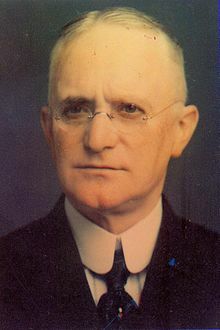 George Eastman became spectacularly wealthy and was quite the philanthropist, founding the Eastman School of Music in Rochester, New York (his adopted home) and also the schools of dentistry and medicine at the University of Rochester, major contributions to the Rochester Institute of Technology as well as MIT and Tuskegee University and Hampton University. Eastman established the Eastman Dental Hospital in London, England and contributed to numerous community clinics. Suffering a spinal injury and in great pain, the great man shot himself in the hear in 1932. Eastman can boast of not 1, but 2 stars on the Hollywood Walk of Fame and has the George Eastman Museum dedicated to his life. Eastman had been the first to patent roll film in 1884. Backus, Jim and Henry Backus. Backus Strikes Back. Stein & Day, 1984. Brayer, Elizabeth. George Eastman: A Biography. University of Rochester Press, 2015. Collins, Ace. Lassie: A Dog’s Life, The First Fifty Years. Penguin Books, 1993. Keeshan, Bob. Good Morning, Captain: Fifty Wonderful Years with Bob Keeshan, TV’s Captain Kangaroo. Fairview Press, 1996. Kluger, Richard. Ashes to Ashes: America’s Hundred-Year Cigarette War, the Public Health, and the Unabashed Triumph of Philip Morris. Vintage, 2010. The featured image in this article, a publicity photo of American child actor, Tommy Rettig, and American canine performer Lassie promoting the CBS television series Lassie, circa 1955, is in the public domain in the United States because it was published in the United States between 1924 and 1977 without a copyright notice. See Commons:Hirtle chart for further explanation. Previous ArticleIs There No End to Naval “Oops” Moments?